Here you will find photos of various electronics and other systems installations performed by Custom Offshore. Should you be interested in anything you see here, please feel free to call us and ask for Jonathan or Jeffrey. This is one of a pair of Elco electric launches that we've setup electronics on for an NJ client. A bench covers most of the system guts, and the display units are under a hinged seat section. The plotter (and the stereo by connection), pilot, and VHF all repeat wirelessly to handhelds so everything can remain neatly out of site and preserve the classic look of the craft. The nav station panel during construction at TPI in RI. Custom Offshore had been contracted by the dealer for this boat (in Nova Scotia) to supply and install the electronics package. Much of the cabling runs were installed prior to the yacht's deck going down, which can save hours of installation hassles. 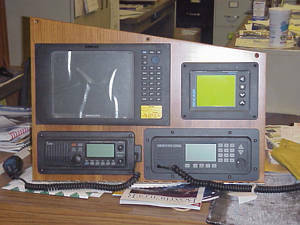 At lower left is an Icom VHF, next to that an SEA SSB. 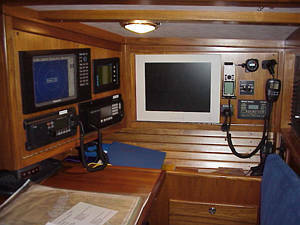 Top left is a Simrad 10" color LCD combination unit, containing a fully automatic differential GPS chartplotter and 4kw dual speed radar. To the right of that is an Ockam Matryx display. A shot of the nav panel after installation. To the right is a VGA flatscreen for the onboard computer, and a host of auxiliary systems, including a backup handheld GPS (hardwired to ships power and an external antenna), and a second station/intercom unit linked to the cockpit VHF. Part of the autopilot installation. The ramset with its fluid reservoir, pump motor, valves, plumbing, and solenoid (not visible, on the back of the upright) is all contained on one sub-chassis that can be removed from the boat for service without disturbing any of the plumbing. The helm, almost completed. 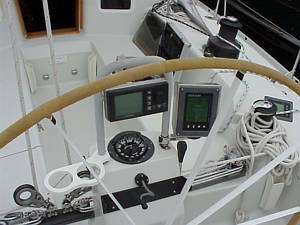 On center in front of the wheel is the Simrad/Robertson AP control head, with an Ockam Matryx display just off to the right. Another Matryx can be seen just ahead of the starboard mainsheet winch, and there is another matching it at the port winch. Notice that the Matryx at the helm is setup vertically while the one at the winch is horizontal. Below the helm compass is a cable feed for the not yet installed chartplotter/radar repeater. On some smaller vessels, such as the J35c pictured here, the autopilot drive will be a self-contained ramset with the pump attached directly and no external plumbing. Here such a ram has been installed to a platform fabricated to support its loads. The ram and the feedback link run to custom aluminum and G10 connector plates fabricated to attach directly to the quadrant. Certain yachts have unusual circumstances and require a different approach to autopilot installations. Sometimes space may be so limited that a balanced ram (such as Simrad employs) cannot fit, as the back of the ramrod would poke through the side of the boat at the full "in" position. One can then either used an unbalanced ram (with their occasional feedback issues) or go to another drive type. Here on a J42 we've used a Whitlock linear electric drive, not to be confused with a linear electric ram. These drives are expensive, but powerful and compact, and have extremely minor feedback resistance. This is a pod with four Ockam Magnum displays for the first US bound Swan 45 OneDesign, RUSH. Custom Offshore’s head honcho went to the Swan plant in Finland to work on the yacht during construction. Doing most of the system cabling runs before the deck is installed saves enough time to be worth the added travel expense, and prevents us from having to tear open the interior of a rather nice yacht. Behind the scenes of a Farr 395 nav panel. Most of the Ockam instrument components are back here, along with wiring harnesses for the plethora of interfacing going on aboard. This 395 has a recess for the laptop built into the nav table. In this layout we need not employ an Ockam display at the nav panel, as all system functions can be monitored - as well as calibration functions altered - via the laptop. A radar install done on an IMX45. The pole and mounting platform are all carbon, with a very simple manual leveling system. The resulting assembly is both functional and very lightweight. The carbon pole is sufficiently stiff that it does not require bracing to the rails. This allows for rapid install and removal of the entire pole and radome assembly for racing vs cruising. A cap seals off the deck opening when the pole is out. Here is an installation of an Ockam Matryx display on a J105. The tiller 105's need a wet compass somewhere onboard and space is limited. Here we've removed one of the windows in the aft face of the cabin trunk and fabricated a mounting plate in G10 laminate to which we've installed an Ockam Matryx display, a wet compass, and a pair of buttons to control a second Matryx that is mounted on the mast. Should the owner choose to move on to another yacht he will likely take his Ockam with him. We can then pull this panel and reinstall the original window to the cutout (unchanged) without leaving any unnecessary holes behind on the yacht. © 2018 Custom Offshore Yachts, Inc. All rights reserved.